Hey everyone! We wanted to start focusing our updates on the mechanics of the game. 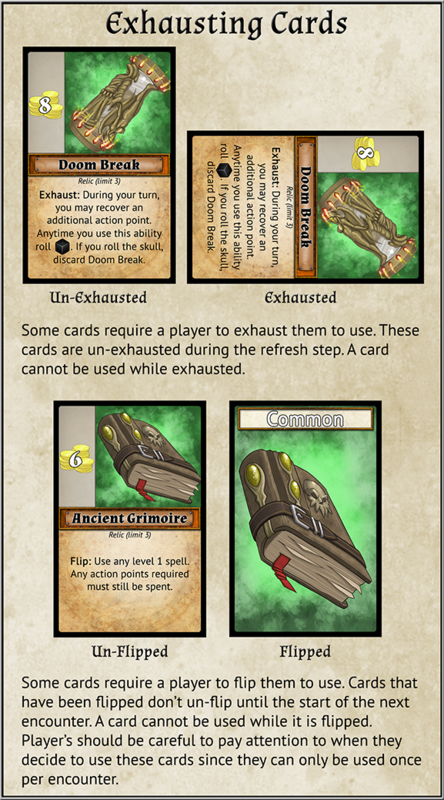 Right now we’re working hard on finishing the rule book so that we can show it off and get feedback. But in the meantime we thought it would be fun to update and post an old post on our website that many of you might have missed. The update in question previews abilities in our game. As players play through the Crawl Mode or the Story Mode, they gain experience points. These points can be spent between encounters on new abilities. Middara contains 5 different ability sets. Each of these sets contains 22 different abilities that a character can obtain, separated into levels. As characters gain experience points during a campaign they can spend those points to purchase abilities from any of the 5 ability sets. There is only one restriction when choosing an ability; before a player can purchase a higher level ability within a set, they must first own an ability from that same set that is a lower level. So for example, if a player wanted a level 2 Martial ability, they would have to own a level 1 Martial ability first. 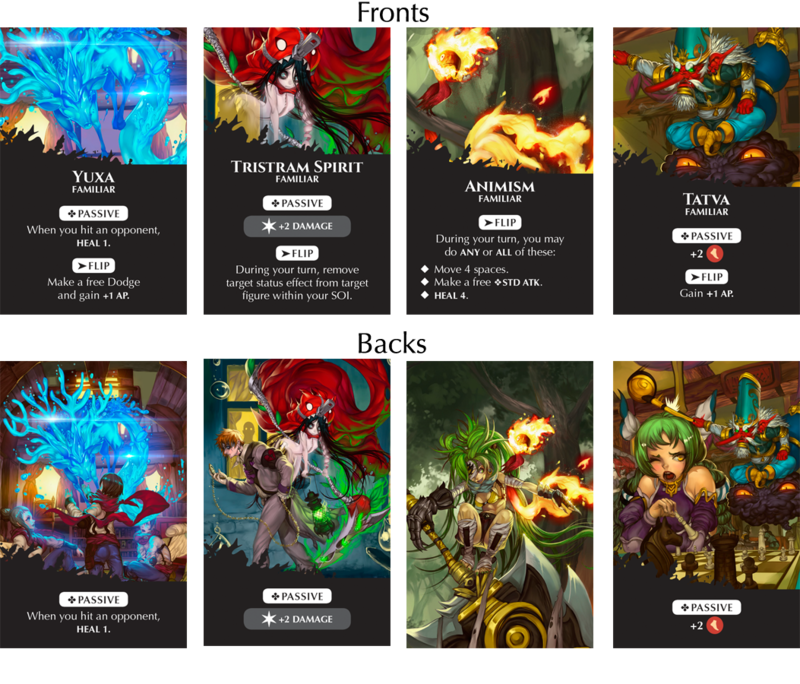 Each ability set has a plethora of options, and players are free to choose as they will. However, each ability set has its own progressive set of abilities that work with each other as players progress down a specific ability path. This incentivizes players a bit to focus on a specific set even though the game also encourages mixing and matching abilities from different ability sets. With the basics out of the way, let’s talk about the different ability sets in Middara. Assemblage is the art of whispering to the things that walk in the realms outside of our own. It allows the caster the ability to deal with the ancient creatures that were once beyond our imagination. The abilities inside of Assemblage often reflect a jack-of-all-trades mentality. This is because the abilities they thematically reflect are as diverse as the creatures you call upon to perform them. In the early levels of Assemblage a player can perform a wide array of actions. From healing, to gaining extra actions, to casting positive status effects, Assemblage is incredibly diverse. 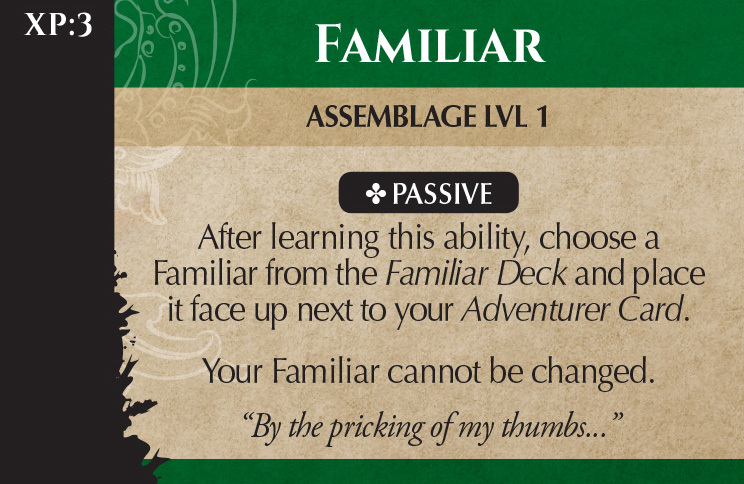 Familiars are a unique ability associated with Assemblage that allows a player to summon and maintain a small creature that gives him a constant benefit. Once chosen, these creatures are forever bound to the caster and can never be changed. 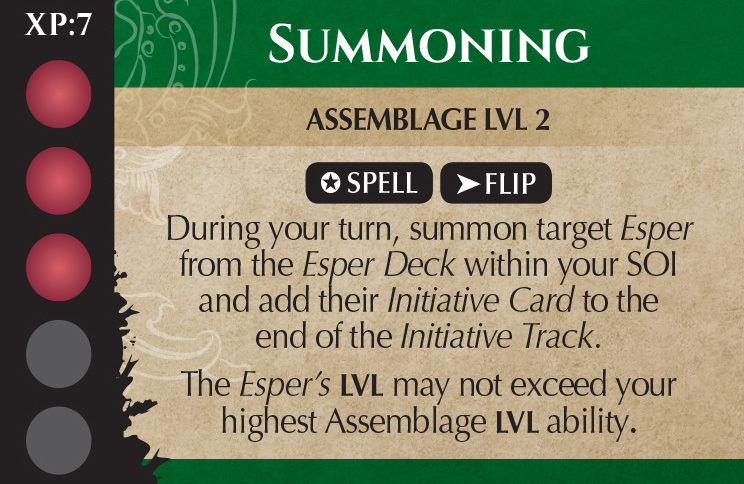 The next unique aspect of Assemblage is its ability to allow a player to summon creatures to the board called Espers. Espers are represented by separate figures on the game board. For all intents and purposes these creatures count as wholly separate figures that act interdependently just like any other figure. Depending on who summoned them, they could be opponents or allies. If an adventurer uses summoning to bring an Esper to the game board, they gets to control them and take their turns. Summoning these creatures allows an Assemblage user to gain access to some more specialized abilities that only non human creatures can cast. 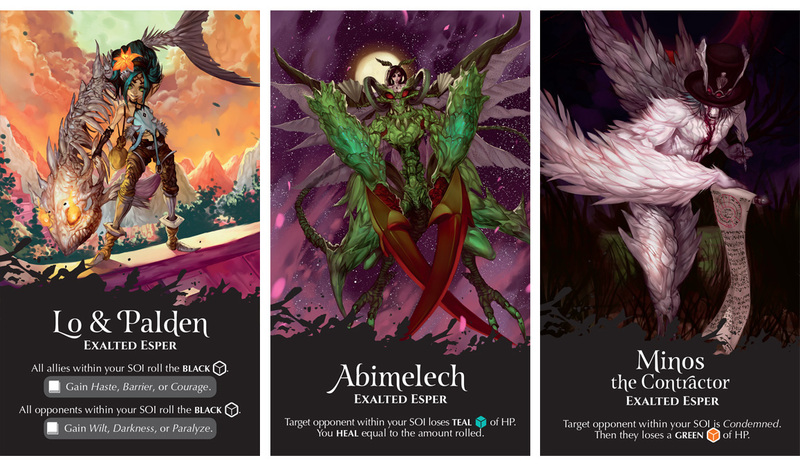 Middara contains 4 different Espers to choose from. 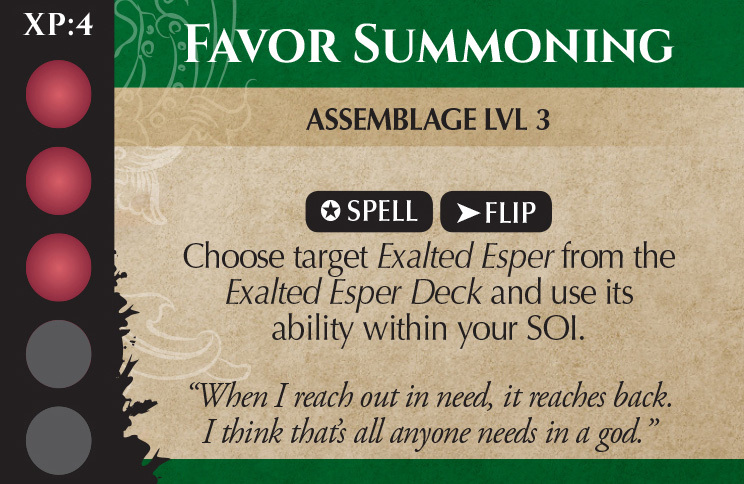 Depending on a summoner’s level, they may summon a wider selection of Espers. Espers have their own set of diverse abilities. 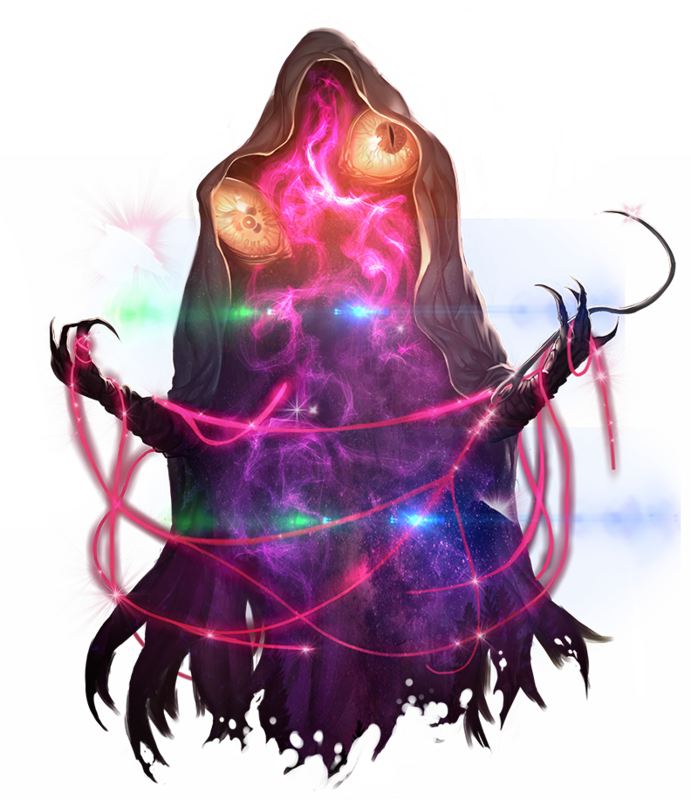 Once summoned, they are placed on the board within your summoner’s sphere of influence. They gain their own action points and have their own Initiative Card which is added to the Initiative Track. Once killed, these Esper are removed from the game board like they were any other character. The ability to bring additional figures to the table who aid you in your struggle is an invaluable ability that is unique to Assemblage. Assemblage contains a different types of Esper that we call an Exalted Esper. These are creatures that are so beyond our understanding that we can only willingly be a pawn in their greater schemes for a moment. To be able to use the creatures, a player must acquire the “Favor Summoning” ability. Favor Summoning is a powerful “Flip” Ability. 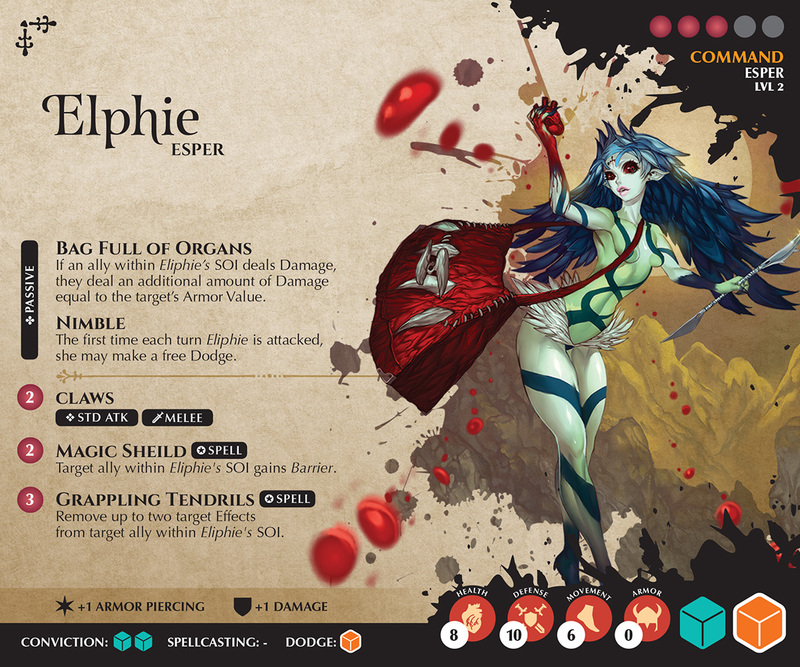 When used, a player may search through the Exalted Esper deck and choose one to call upon to change the tide of battle. This deck is printed on tarot sized cards. The Last unique aspect of Assemblage we wanted to go over is Conduction Summoning. This ability allows Assemblage users to change their shape and physically become other beings. 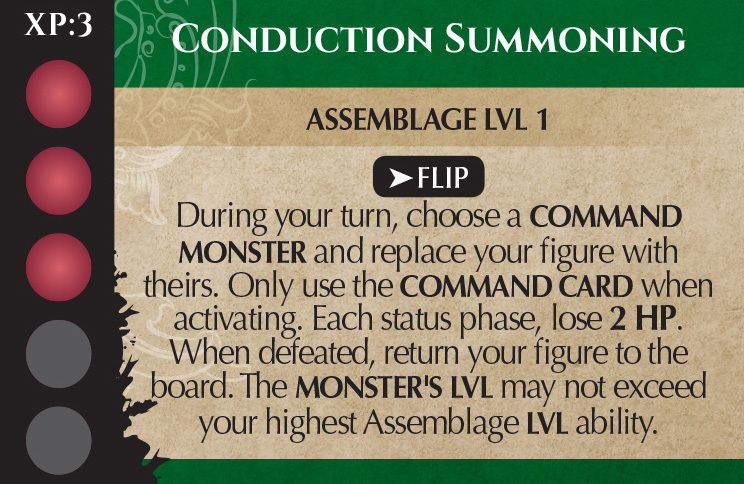 When used, conduction summoning replaces your character with a Command Monster of your choice. For the duration of the encounter, or until killed, your figure gets to become that creature. In Middara, each Combatant card is double sided. One side contains the A.I. version of the combatant, while the other contains the Command version. This is the version a player would use if they were playing the combatant. This can happen when using our 5th player variant where a player gets to play against the adventurers by controlling the antagonists or when using Conduction Summoning. At its heart, Cruor is risky by nature. Its abilities can give its casters a lot, but only if they are willing to give a little. It doesn’t have fancy Esper it can summon or neat gimmicks to win fights. Instead, it focuses on raw power to get the job done. 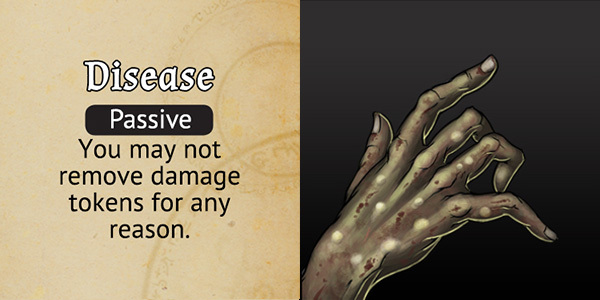 Cruor grants the ability to curse your enemies into dust, disease them, ruin them, and liquefy them. Those who go down the path of Cruor can expect to reap great rewards, from the power to grow natural wings, claws, and other permanent personal augments, to the power to control light and darkness. If you ever wanted to leave rot and death in your wake? Cruor is for you! Cruor contains the earliest damage dealing spell in the game. What makes Organic Liquefy so powerful is its ability to cause life loss equal to the difference by which the target failed the check. A good roll on behalf of a well-equipped caster can outright kill weaker monsters and severely injure more powerful ones. Sounds great right? Except remember that many monsters in Middara are created using a combination of the same abilities that adventurers can use. Organic Liquefy has ended a handful of our play test sessions swiftly for both sides. 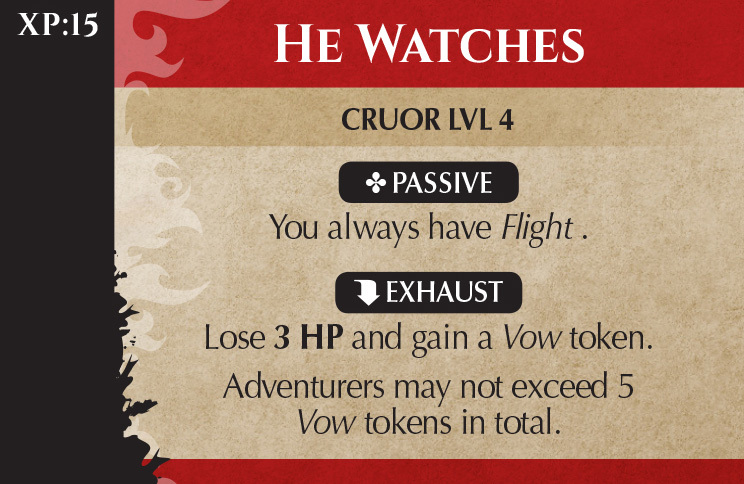 Specific to Cruor is its ability to augment your character using vow tokens. This effect is unique to Cruor and can’t be gained any other way. 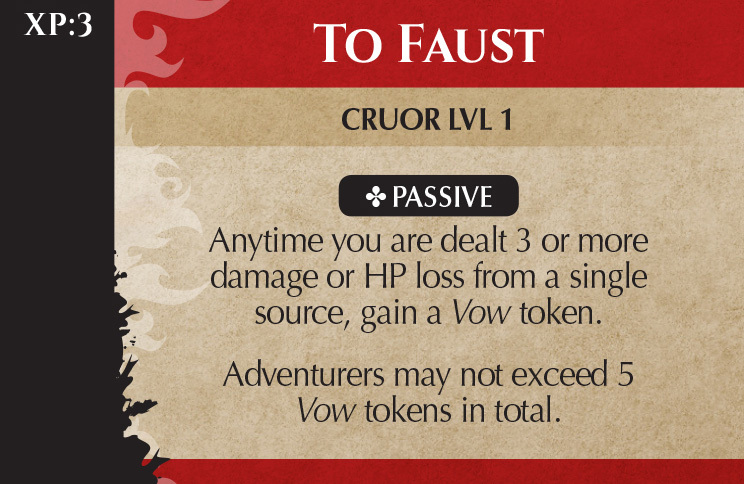 Using “To Faust,” a player can begin gaining vow tokens. A player can have up to 5 vow tokens at any given time. 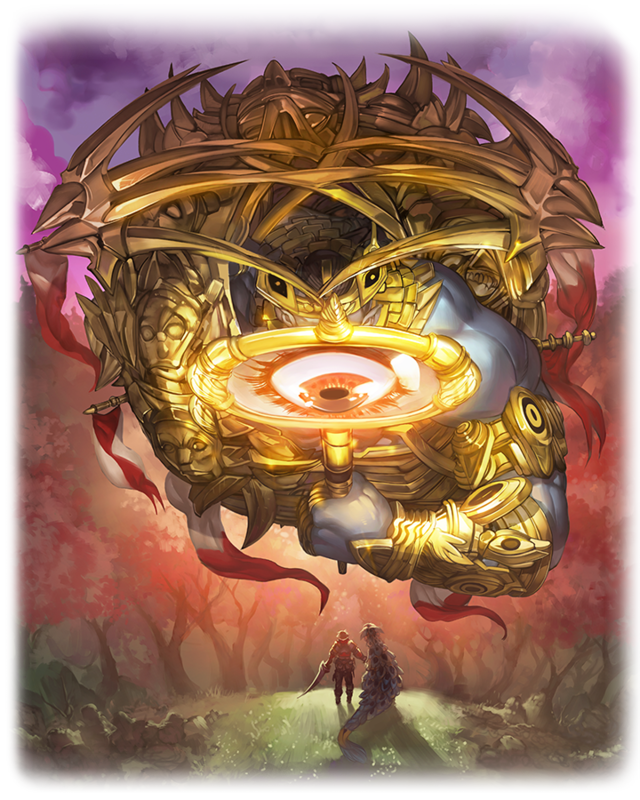 And, at anytime, a player may discard as many vow tokens as they would like to gain +2 damage for each token spent for the remainder of the turn. 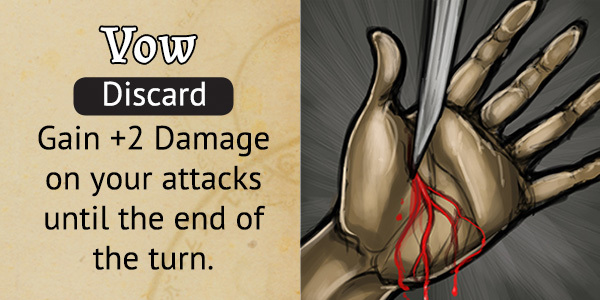 This allows a player to put out huge damage with their standard attack. These tokens can compliment any melee or ranged build in the game and can even be used when an opponent provokes a Break Attack. As players continue down the vow path within the Cruor set, they will begin to see a more substantial increase in power. 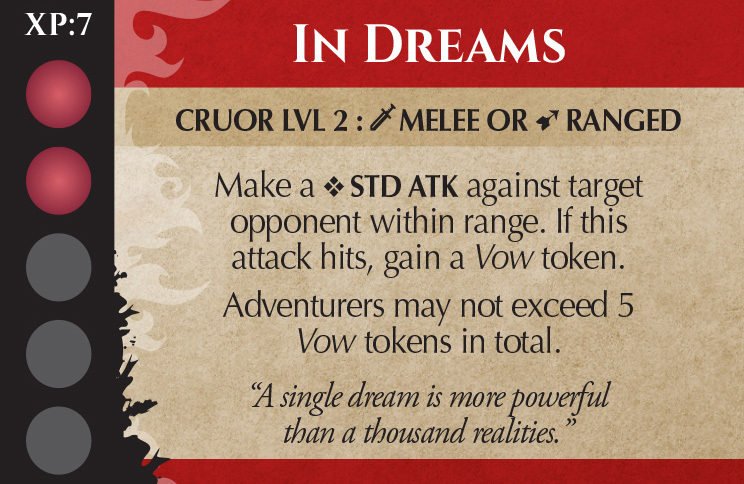 Once they reach “In Dreams,” they gain an Standard Attack that generates vow tokens by simply hitting. This can be combined with a plethora of abilities from Martial or Subterfuge for devastating affect. 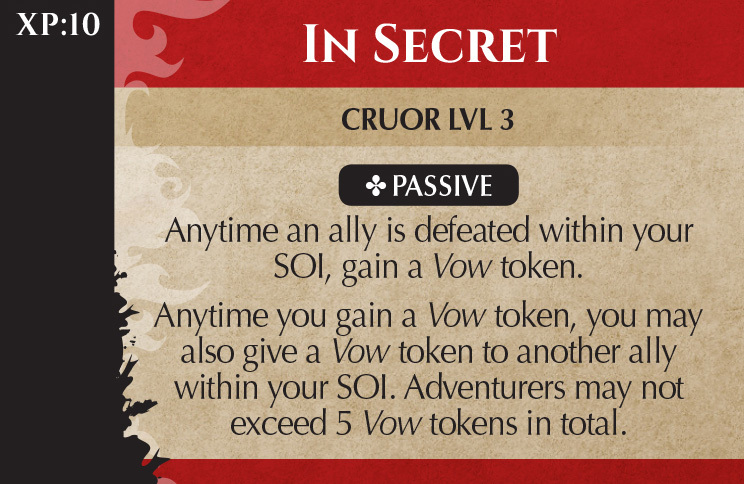 “In Secret” provides players another avenue to gain vow tokens faster, but more importantly, it allows them to begin giving them to other adventurers within their SOI. This also helps sidestep the 5 vow token per player limit by spreading them among your allies when you hit your limit. It’s important to note that a player isn’t required to get all of these to use vow tokens; there are plenty of decent builds that use vow tokens that skip some of these abilities entirely. Regardless, following the vow path begins to exceptionally shine when players get the level 4 ability. “He Watches” is one of the few ways a player can gain flight in Middara, not to mention, gain it permanently. Once a player gains this ability they are thematically granted wings by some greater entity. 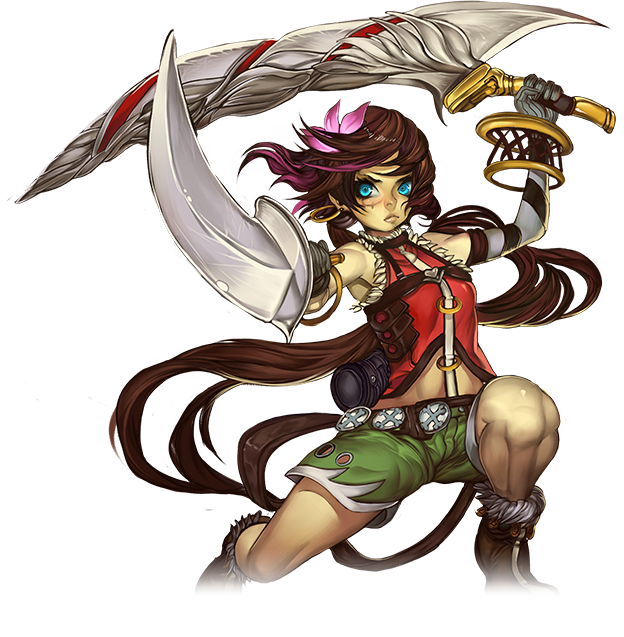 In addition, you statically have +2 damage and the useful ability of adding vow tokens in exchange for vitality. Alas, if only picking a level 4 ability was that easy though. Each tree has three different level 4 abilities, making a decision when you get there difficult. Sanctus boasts a wealth of strong spells that transcend the mold of cleric or healer class spells. Sanctus is diverse in its abilities. It can grant magical armor, temporary wings, or even allow its users to manipulate the probability of the universe. A staple within the tree is its ability to bestow the positive effect of Intervention. Once gained, Intervention can be discarded at anytime to re-roll one or more of your own dice during a roll. It’s invaluable and one of the few ways a player can re-roll many dice. More importantly, it can be cast on other adventurers. 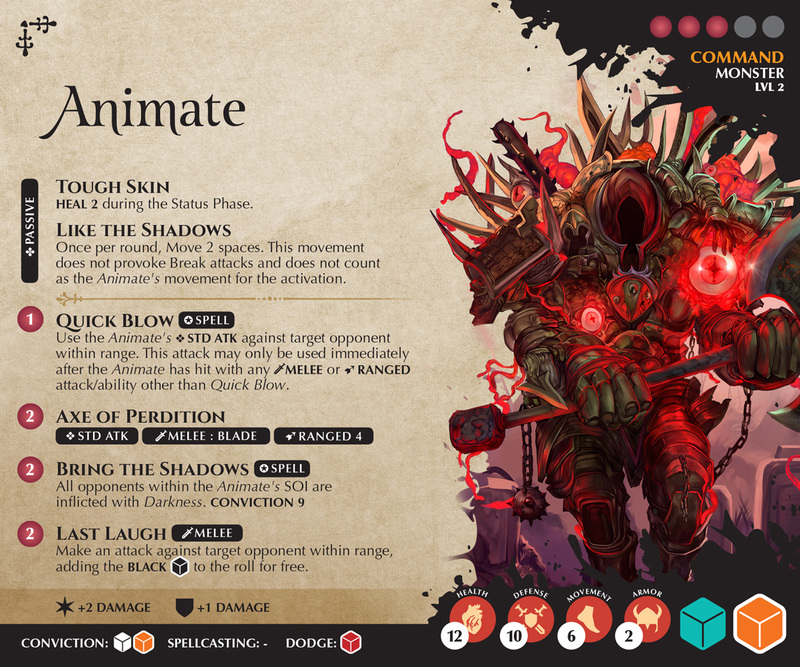 Sanctus shines in its ability to buff adventurers in combat, as well as prevent them from succumbing to damage over time, and other negative effects. Soul Clear removes status effects from any figure. This can be positive Status Effects on Opponents or negative ones on your Allies. But remember, monsters are typically designed to use combinations of abilities that adventurers use. This means that there are monsters who will Soul Clear your positive effects and remove negative ones from themselves. 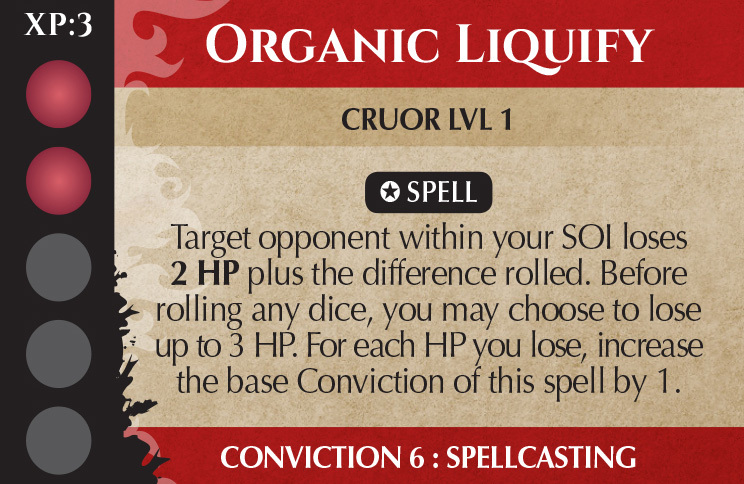 You’ll notice that Soul Clear has CONVICTION 6: SPELLCASTING printed on the bottom. In Middara, any spell used on a friendly figure happens automatically and doesn’t require a Conviction check. However, Spells used on Opponents require a conviction check to take affect. 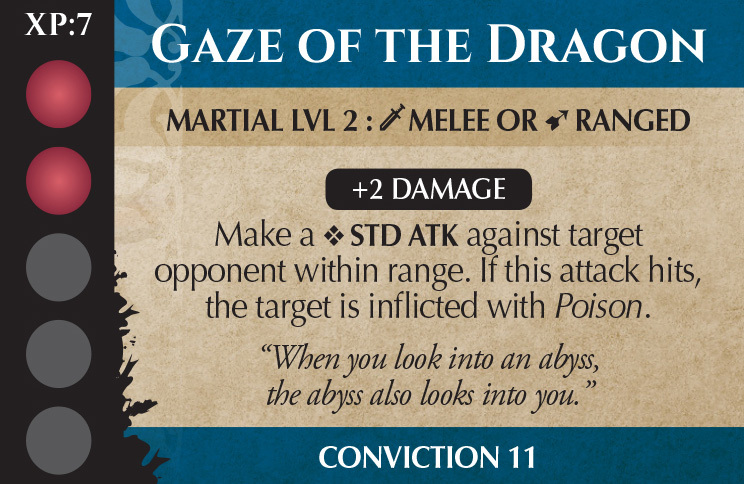 This means that if a player tries to use Soul Clear to remove a Status Effect on an Opponent, that Opponent would keep the Status Effect unless they failed the Conviction Check. Healing is a staple in JRPG’s, and Middara is no different. However, it’s important to remember that monsters use healing just like the players. We have a handful of different ways that players can heal. Guardian Angel allows players to build characters who can participate in combat while still being able to heal themselves and those around them. Some Status Effects can even prevent combatants from being healed. While at first glance, Sanctus might seem passive and all about utility, it can be built very offensively. Many of its abilities can be used to complement aggressive builds from other Ability sets. Like Cruor, Sanctus also contains a direct offensive spell. However, its damage is based upon how much armor the caster is wearing. A tanky mage is just another option in Middara. Another unique ability within Sanctus is Taunt. It forces an opponent to choose you as a target when they attack. While this ability is really good in full coop, it’s especially fun to use when fighting a real opponent in our 5th player variant. Have you ever wanted to be a ninja? We have. Subterfuge has been a long time in the making. We had to balance it… and then balance it again. Whereas the Martial Ability set contains combat skills, Subterfuge is more akin to causing magical effects while using normal weapons. In addition, it contains a wide range of utility abilities as well as offensive abilities. Its abilities also tend to have a “go big or go home” feel to them. Since players can mix and match abilities from different trees, you will notice very quickly that there are some really great combinations. Quick Blow is a very popular choice among our play testers. In Subterfuge, players can go down a specific path that really makes you feel like a shinobi. Starting with Speed Injustice, players can gain a passive dodge upgrade. Dodging is an invaluable asset in Middara; some of the tougher monsters can kill you in one or two hits if you’re under-geared and can’t dodge. Subterfuge is a great way to complement any build that needs more survivability. Combined with some great mobility, Subterfuge begins to shine very early on in its tree. Players can take Profound Intuition and combo it with Speed Injustice for some nasty counter attack madness. Plus, you get to fly around the board dealing damage. . . which is really neat. Ninjitsu! Which is almost overkill for your average opponent mid game, but when facing something like a Shadow Lord, you will be super happy you have it. 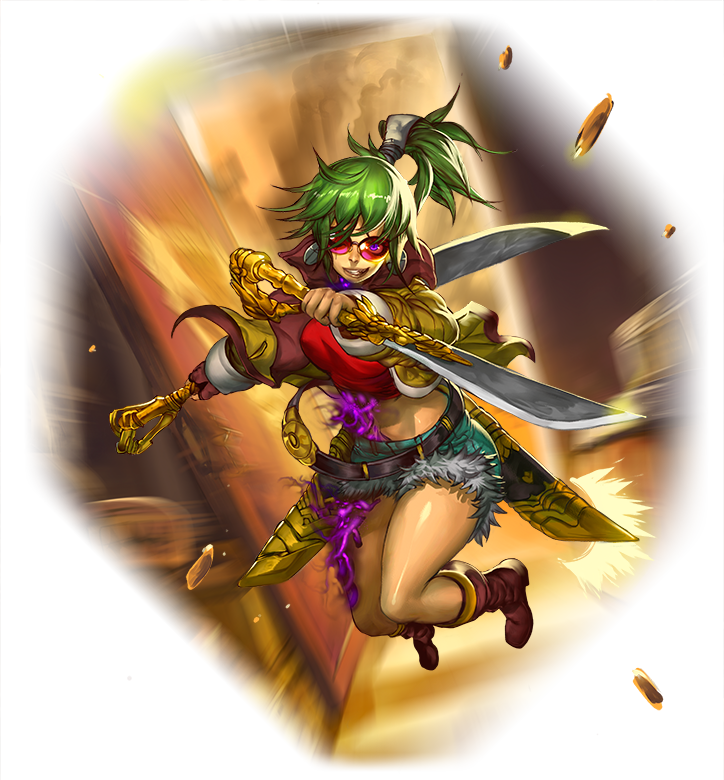 Martial is the bread and butter of melee and ranged combat in Middara. 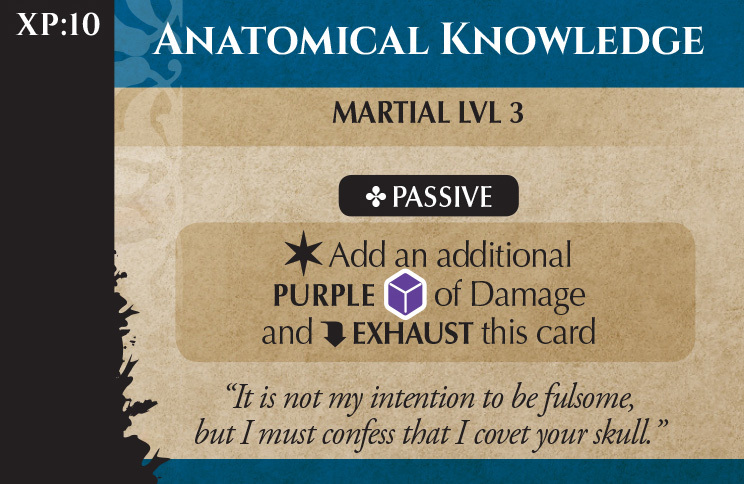 While many builds can make your standard attack viable without Martial, novice players will find it much easier to just take some abilities in this ability set eventually. Martial can achieve ranged or melee builds in equal capacity, and a player should consider both in some cases. Some weapons like Ruthless Skewers can be used at both melee and ranged, meaning that you can use abilities that work for either while using this weapon. Martial contains abilities that add a specific bonus to particular equipment. These abilities are best taken if there is a specific weapon type you are interested in using primarily throughout the campaign. Middara differentiates two handed weapons builds from dual wielding builds. 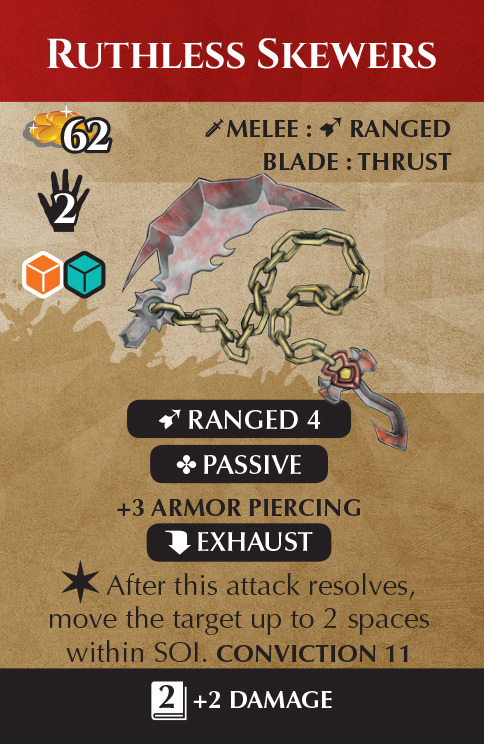 Typically, both builds will output the same amount of damage, however, a two handed build is cheaper and it also can have the unique “Reach” ability that allows players to make Melee attacks against opponents at more than one space away. A dual wield build might cost almost twice as much as a two handed build, but it comes with the innate advantage of having two separate pieces of equipment with their own utility. Like the example cards above, there are different abilities that reference different types of equipment. Depending on your equipment preferences, certain abilities will appeal more to you. Martial also contains abilities that are meant to replace your standard attack. These abilities cost just as much as a standard attack, only they provide an additional benefit. 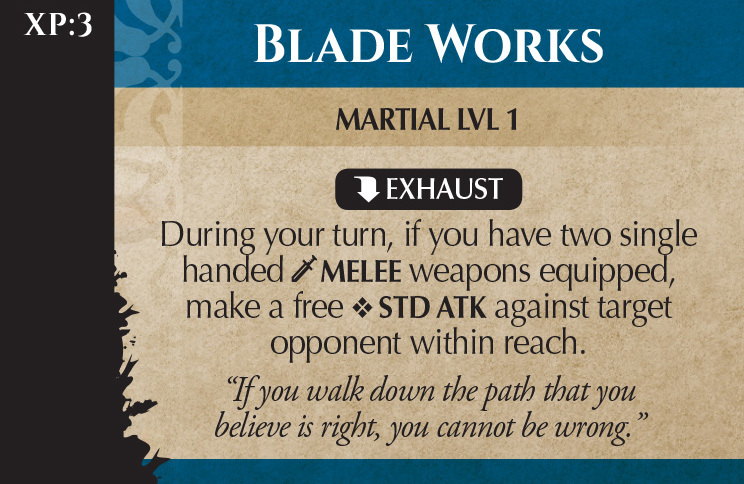 Martial also contains many abilities that compliment standard attacks. 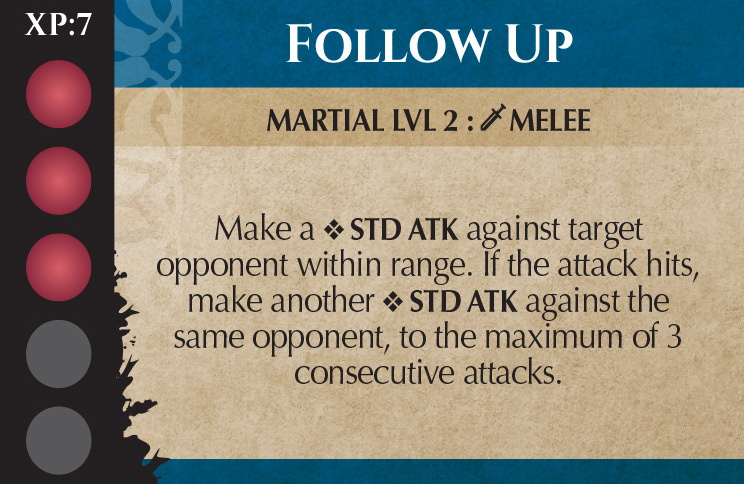 Follow Up, for example, is an ability that allows a player to make multiple attacks assuming they always hit. Martial has many abilities in this vein. Lastly, Martial contains many abilities that use critical symbols. Critical Symbols can come up on any dice, however, they don’t do anything without equipment or abilities that say otherwise. This can enhance any attack made in the game. Thanks for checking out our update this week! We hope we can get the rulebook finished and out in the next couple weeks. Thanks again for your patience.